Astronaut Scholars Nathan Rayens (middle) and Bob Krueger. Astronaut Scholars. Scholars are among the best and brightest minds in STEM who show initiative, creativity and excellence in their chosen field, according to the Astronaut Scholarship Foundation. Bob Krueger studies graph theory, which he explains in the video below (photo by Scott Kissell). 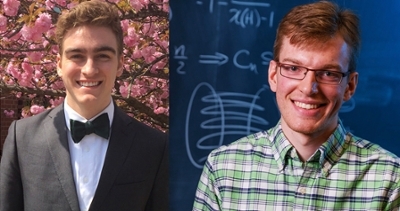 Miami University seniors Bob Krueger and Nathan Rayens have been awarded Astronaut Scholarships from the Astronaut Scholarship Foundation (ASF). They are two of 50 students from 36 universities nationwide to receive the scholarship, worth up to $10,000, for the 2018-2019 academic year. The Astronaut Scholarship is among the most significant merit-based monetary scholarships awarded to undergraduate STEM juniors and seniors. Scholars are among the best and brightest minds in STEM who show initiative, creativity, and excellence in their chosen field, according to ASF. Krueger is a mathematics and physics double major and a computer science and statistics double minor from Wadsworth. 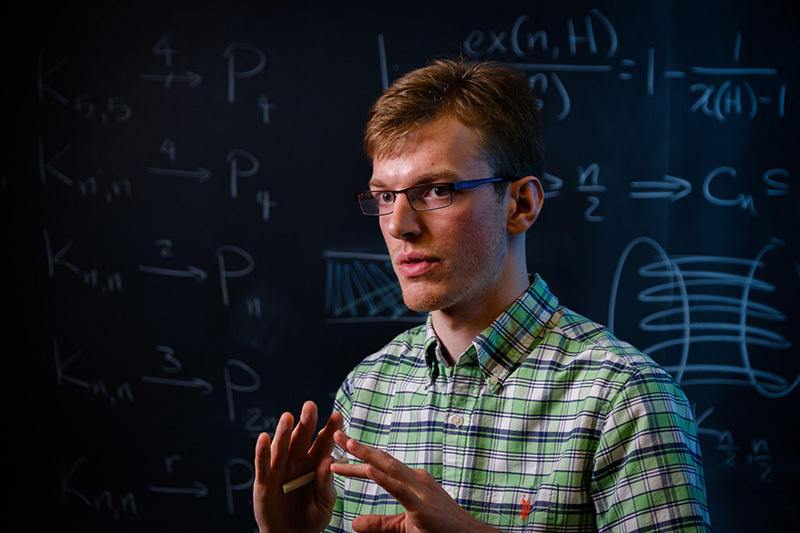 He works with faculty mentor Louis DeBiasio on research in the area of mathematics called graph theory, studying the properties of abstract networks. “Because of the necessary background material, a typical student of mathematics won’t have the opportunity to do serious research until graduate school,” DeBiasio said. “Bob, not being a typical student, started working with me on research during his freshman year. Over the years Krueger has transformed from “being my student to being my research collaborator,” DeBiasio said. Krueger is a member of the university honors program, the Society for Physics Students and the math honor society Pi Mu Epsilon. This summer he is participating in the highly selective Research Experience for Undergraduates program at CUNY’s Baruch College. This fall he will participate in the prestigious Budapest Semesters in Mathematics program in Budapest, Hungary. He plans to pursue a doctorate in mathematics after graduating from Miami. Krueger is also a 2018 Goldwater Scholar. Music performance is Nathan Rayens' third major. He was a winner of Miami's Concerto Competition in 2017. Rayens is a mechanical engineering, manufacturing engineering and piano performance triple major from Lexington, Kentucky. He plans to pursue a doctorate in materials science after graduating from Miami. His interest in that area of engineering was fostered by the courses Engineering Materials and Manufacturing Processes, within the department of mechanical and manufacturing engineering (MME). Rayens said courses in his music major — particularly music history taught by Elizabeth Hoover, senior lecturer in music, and piano lessons with Siok Lian Tan, associate professor of music — encouraged self-sufficiency, focus in areas that he is passionate about, and applicable research skills. Due to a heavy course load at Miami during the academic year, he participated in undergraduate research at the University of Kentucky during the past two summers. 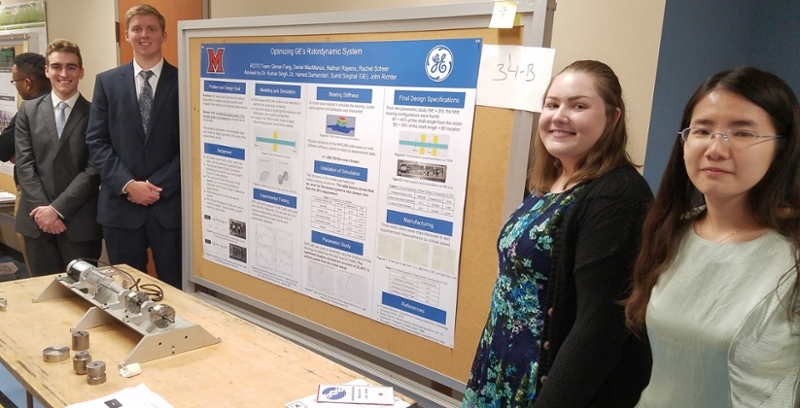 His projects included researching spin-coating materials for use in lithium ion batteries and developing a MATLAB (software) tool to estimate material properties from aluminum micropore geometry. Rayens (left) and his MME senior design team presented their project on optimizing a rotor system for GE. This summer he is participating in a National Science Foundation Research Experience for Undergraduates project in automotive engineering at Technische Universität Darmstadt in Germany. Rayens “has a genuine desire to positively change the world around him and the intellectual daring to do it,” Tim Cameron, chair and professor of MME, said. He has the drive and talent that foreshadow a creative career "leading to the advancement of scientific knowledge and technology." Rayens is a member of the engineering honor society Tau Beta Pi and of the Music Teachers National Association. 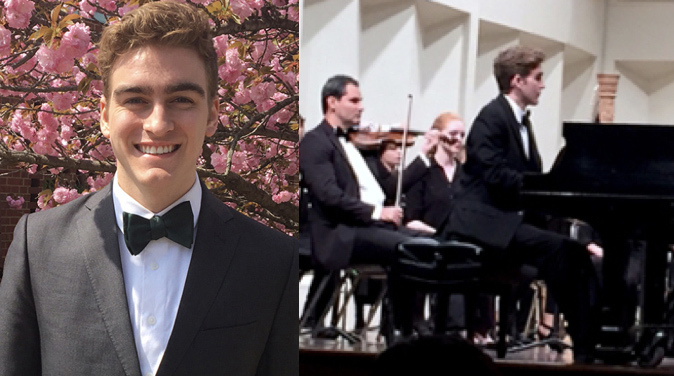 At Miami he works for the music department as a collaborative pianist and regularly participates in music ensembles, including the Miami Men’s Glee Club. Rayens was a winner of Miami’s Concerto Competition in 2017. Astronaut Scholar recipients are engineering, natural or applied science or mathematics students who intend to pursue research or advance their field upon completion of their final degrees. Scholars must be nominated by a faculty member, be entering their junior or senior year at one of the 40 schools the foundation supports and demonstrate excellence in research and academics. Miami’s office of the provost partnered with the ASF to provide matching scholarship funds that allow a second scholar to be named. A member of the Astronaut Hall of Fame will visit campus during fall semester to give a public lecture and to recognize Krueger’s and Rayens' achievements.